In part 1 it was mentioned that the ColorMax is a great (modern design) retrocomputer for interfacing to the real world. 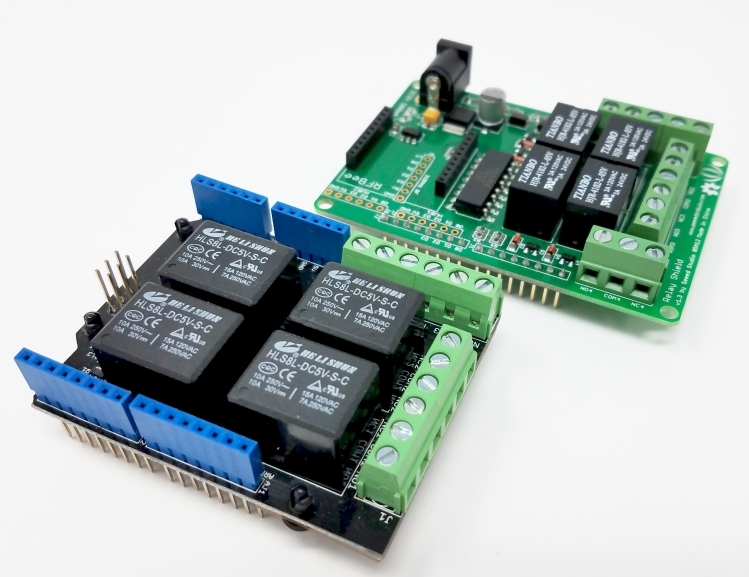 Using the Arduino Shield area on top of the ColorMax, it is easy to interface to a relay module shield. Pictured are two relay shields that I pulled from my collection. They both control 4 relays and they both use the same lines to do so. I had really hoped that they would use different lines so that I could stack them and control 8 (or even 16) relays total. It would have been great if the design of the relay board could have included some option to select other control lines. So here is my setup for this article. A VGA monitor and a small PS2 keyboard attached to a ColorMax (on an anti-static platform). 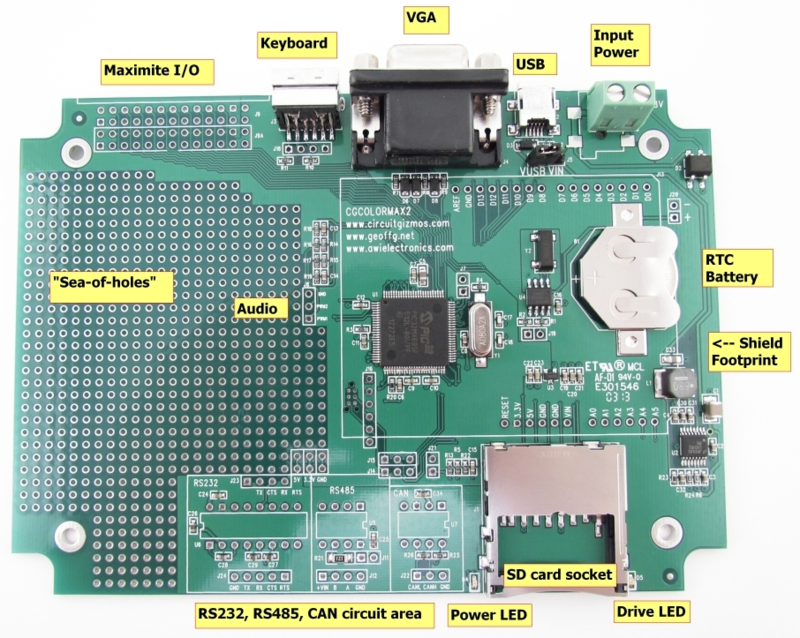 The Arduino Shield footprint on the ColorMax is populated with headers to accept the Relay Shield. The ColorMax is powered by a 12V supply and connected to a PC via USB. With the ColorMax bare naked, the relay board is installed onto the headers. That leaves the relay board ready for control by BASIC. Here on CircuitGizmos one of the popular products is the CGCOLORMAX2, or as we call it the ColorMax. The ColorMax is a VGA color-output retro computer that is a lot like a 1980’s home computer (TRS80, C64, etc) running on modern hardware. 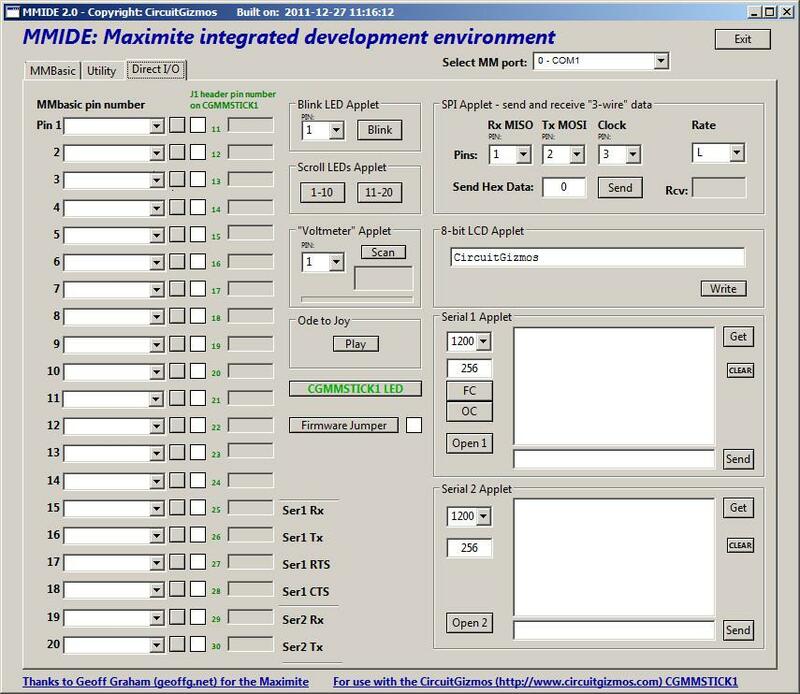 The ColorMax is based on (and compatible with) Geoff Grahm’s Color Maximite design. This retro computer is very similar to the computers that sold in great number in the 80s. The ColorMax powers up to a BASIC prompt, much like those earlier machines. The BASIC is much more advanced, however. The ColorMax’s BASIC doesn’t require line numbers. It is closely compatible with MSBASIC, but has a lot of extensions. BASIC (4.5) runs at about 30,000 lines per second. 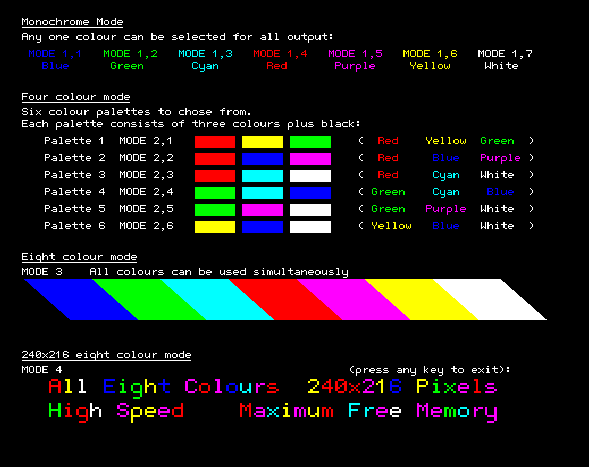 The ColorMax can be plugged into a VGA monitor (8 colors at 480×432 pixels) and a PS2 keyboard. The ColorMax has an SD card slot for up to 32G of program and data storage. The 32 bit processor takes care of the video and SD card interfacing. The VGA output can display graphics or 33 lines by 80 characters of text, or a combination of the two. Graphics support in BASIC includes pixel, line, rectangle, and circle commands. Custom fonts, BLITs, SPRITEs, and BMP files are also supported. 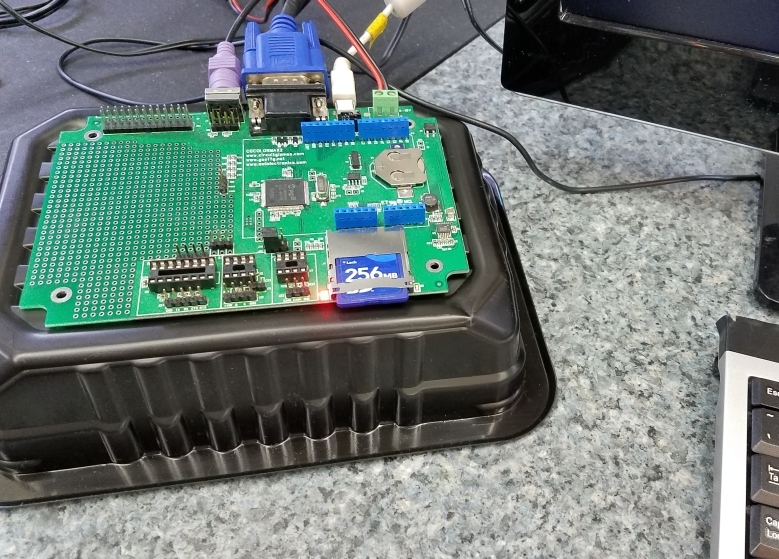 As an alternative to VGA, monochrome composite video (in PAL or NTSC) is supported. More than just a fast and capable retrocomputer, the ColorMax supports a serious number of ways to interface to the real world. 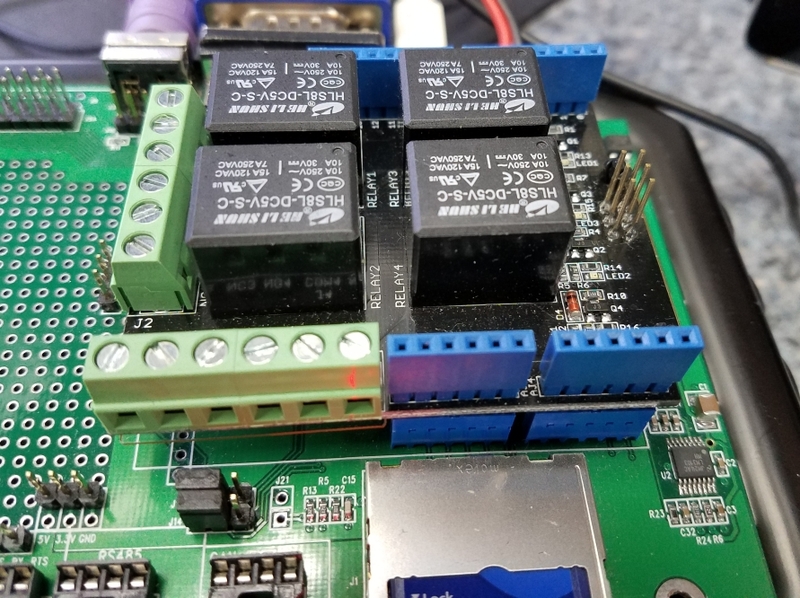 A dual-row connector on the back of the board has 20 lines that support digital i/o, analog input, frequency, period, and counting. 20 additional lines are arranged in an area centered on the top of the board in a pattern compatible with the use of Arduino Shields. Analog output and even sound can be achieved by the use of the two PWM outputs. A number of communications protocols are implemented. These include I2C, serial (RS232 and RS485 with a suitable driver chip), SPI, 1-Wire and CAN (with suitable driver). The ColorMax has an area on board where the support/driver chips can be installed. The ColorMax can operate as a stand-alone retrocomputer, or can be linked to a PC (via USB) for development. The time-keeping facility of the on-board BASIC is augmented by the battery-backed-up Real Time Clock. ColorMax technical information at this link.